Boy oh Boy! Cooking up that baby and my subsequent abandonment on Booby Island sure took a lot of time! I did have the good fortune to eat many good things along the way, so if baby would just sleep for more than 10 minutes at a time every once in a while, I might just share them with you! FX, let’s go! I must take a moment to praise the humble vegetable OKRA. IMHO no-one eats enough okra. Okra has to be one of my most highly rated, first eaten side veggies that comes in never enough quantities in my CSA share. Cutting okra lengthwise (halves, quarters or sixths, depending on diameter) drastically inhibits its gummy nature and makes it more of a cousin to the green bean in taste. YUM! 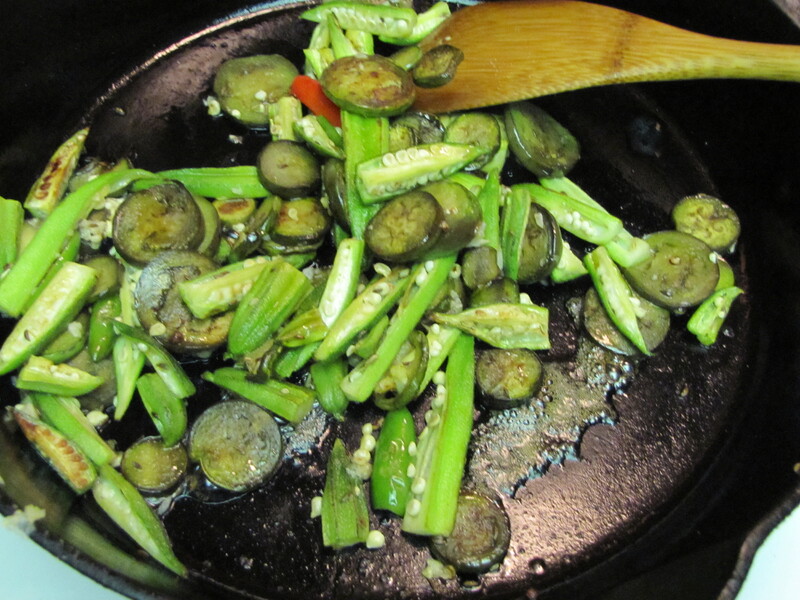 In the case of this okra (and eggplant) I used agave nectar, lime, caraway (REALLY yummy with okra, and generally under-utilized as a seed altogether), salt, garlic & serrano. The SEED category basically means SPICE (like caraway, cardamom, coriander, cumin, mustard, anise, etc.) but for me I far prefer to think of it as SEED. This is because when cooking just about any dish I cook, but particularly veggies, I try to make sure every plant part is represented. This means roots, stems, leaves, fruits, & seeds. Every plant part represented = a well balanced dish. I also hope to not confound “spicy” ingredients with “spice” ingredients. So since English is a little lacking with this distinction, I’ll just stick with SEED. When implementing the 5 S’s, spicy does not necessarily mean HOT. Often it will come from onions, garlic, ginger, turmeric, or many other delightful piquant possibilities. Many of these ingredients also feature BITTER, which is the most sadly misinterpreted and overlooked taste category out there. Bitter (the 6th taste) comes especially from chili skins, which make them one of my essential ingredients in just about every dish, whether I choose spicy chilies or not! So enjoy! I hesitate to display ingredient ratios here because it very much depends on how much you have. Start with at least 2T bacon fat over medium-low heat if you’re lucky enough to have local organic heritage hog access. Otherwise butter or olive oil will do. Toss in your lengthwise-cut okra, spice-seeds (about 1/2 t. caraway in this case) and sprinkle in your salt. Spice-seeds need to be put in at the beginning to open up their flavor. Salt goes in to start letting the water. You can add your chilies after about 4 minutes. At about 8 minutes you can add a clove or two of minced garlic, a squeeze or two of agave nectar (or other sweetener), and lime juice (or other sour). Keep tasting until you can’t stop yourself from eating it all. Then share. ENJOY!